Registration for this hike is open and is limited to the first 20 people to sign up. 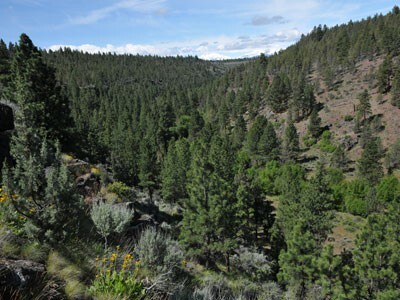 Join the Deschutes Land Trust and Deschutes Brewery for a beer-themed hike at the Land Trust's Whychus Canyon Preserve. This walk is part of the Beers Made by Walking program that features a handful of Oregon breweries creating unique beers that are a portrait of their local landscape. Deschutes brewer Veronica Vega will help lead the hike and talk about the edible plants that will go into the Brewery's beer. Land Trust volunteer Jane Meissner will add her vast botanical knowledge as a long-time Central Oregon naturalist. The hike will follow a trail through old-growth juniper forests that ends at a boulder outcropping with amazing views of Whychus Creek and the canyon. Snacks/lunch, water, hiking boots, seating pad or cushion. Dress for the weather. ***The special Deschutes Brewery beer that will be a part of the Beers Made By Walking program will be available this fall at Belmont-Station in Portland and at the Deschutes Brew Pub in Bend. A portion of the proceeds will benefit the Land Trust.